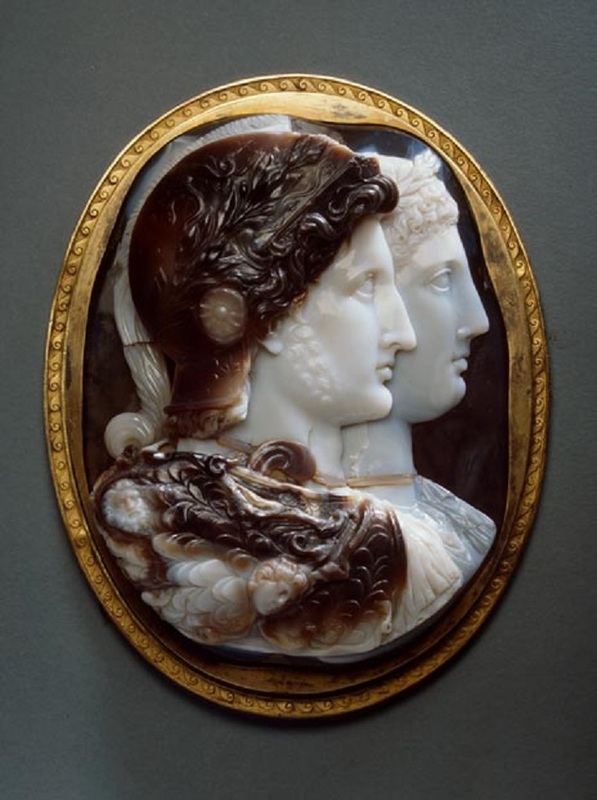 This cameo, a rare example of the large ‘dynastic’ stones of the Hellenistic age, was created in the 3rd century BC in Alexandria. The rulers of Egypt, King Ptolemy II Philadelphus and his wife Arsinoe, are portrayed as gods from the Greek pantheon. Basing himself on an image formed under the influence of the personality of Alexander of Macedonia, an unknown master engraver created an idealized portrait of the king as hero, and emphasized the unity of the royal couple in this profile portrait. Their heads are crowned with laurel wreaths. 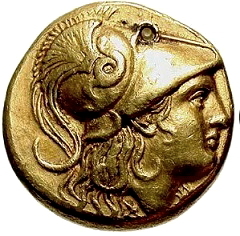 The king’s attire is part realistic and part symbolic: the helmet is decorated with a star and a winged dragon; Zeus’s aigidos, attribute of the most significant deity of Hellas, is thrown over the king’s armour. The pathetic heads of Medusa and Phobos, genius of Horror, intensify the fantastic nature of the king’s dress. The qualities of the agate, in three layers, enabled the engraver to create a unique example of spectacular ‘painting in stone’, in which delicate colour transition and contrast seem to be inherent in the material itself.